Since I have this new ice cream maker, I've really been taking advantage of it. I know that sounds like I've been gorging myself on ice cream, but the funny thing is that I make all this food (ice cream and other) and usually don't eat it. I'll taste it and maybe have a little, but my husband or son will eat most or I'll send some to my folks. I just love the actual act of cooking, baking and recipe writing. I could sit here for hours and just write up new ideas and recipes; it's just so exciting to find new flavor combinations and new ways to create in the kitchen. That's how this ice cream got started. A couple weeks ago I tried my hand at one of those 'premium' ice creams. 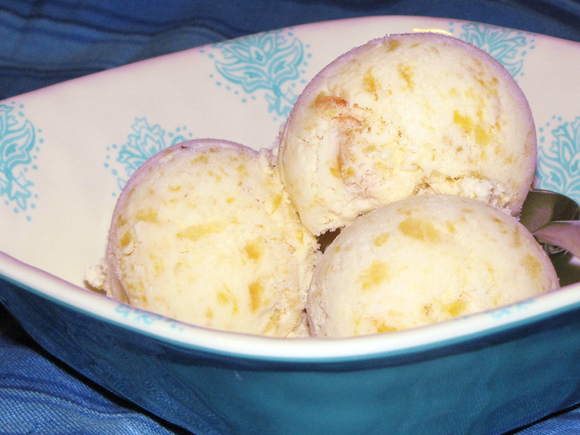 I had some peaches and nectarines that were getting soft so I thought I'd make a peach ice cream with the added bonus of nectarine. I've never seen it before so I thought I'd give it a shot and make it sort of like a double feature. I researched some recipes out there along with the ones that came with my ice cream maker and wrote up a recipe that I was pretty happy about. A lot of the premium ice cream recipes out there have a ton of eggs that are just mixed in, not cooked. The amount of eggs used seemed high (most had four!) and the thought of uncooked eggs in my ice cream just sounded, well, gross. Now you don't really have to worry about eating uncooked eggs if they are pasteurized, but cookie dough is one thing...ice cream is another. I decided to include cooking the eggs in my recipe just to appease my own specific tastes. Anyways, when the ice cream was done, it was really good. It was also really rich. A bit too rich for my liking. My mom, on the other hand, loved it! The flavor was nice with the contrast of peaches and nectarines, and because I used cream and eggs, it was very smooth on the palate. It also wasn't too sweet as I let the fruit give off a lot of their own natural sugars. Don't like nectarines? Use all peaches. Don't like almond extract? Use vanilla like most of the other recipes out there. I just prefer the taste of almond extract because it has that sweet, cherry-like flavor. Experiment with different fruits but be sure to adjust the sugar amount accordingly depending on the fruit you use. Super sweet fruits won't need as much while tart fruits might need a little more. 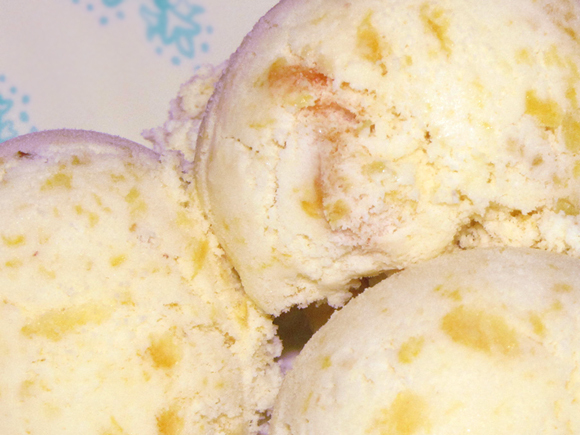 Ice cream is so much fun to make and it's so easy to put your own twist on recipes out there. So have fun. Eat ice cream. 2. Mix peaches with 1/4 c sugar and almond extract. Refrigerate for 1 hour. 3. Combine cream, milk, 1/4 c sugar and 2 TB sugar in pan. Bring to almost boil over medium heat. 4. In a medium sized bowl, whisk 1 egg and 1 egg yolk together. 5. Slowly add about 1/3 cream mixture to eggs whisking continuously. This will temper the eggs so they don't curdle. Add the remaining egg mixture to the pan with the remaining cream mixture while stiring continuously. Cook over med-low heat for about 3 minutes until slightly thickened. 6. Transfer to bowl and cool for 1/2 hour on the counter. 7. Place in refrigerate and cool for 1 hour. Stir in peachs and transfer to ice cream maker. Freeze according to instructions on ice cream maker. 8. For best results, chill for about 2 hours after churning to harden a little before serving.